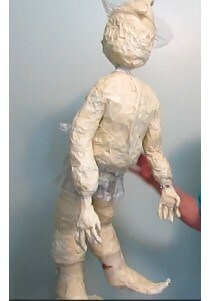 The armature for the scarecrow sculpture is ready for its paper mache clay. I hope to apply the pm clay in the next few days, probably in two coats. I’ll start with a base coat, and then add a few details like buttons and facial features over that. All of the clay has to be completely dry before I can add the waterproofing sealer, so I’ll probably let it dry for at least a week before adding the sealer to the sculpture. I should mention that this is an experiment, just in case you didn’t happen to see the previous post. I’m reasonably positive that the sealer will work, but we won’t know for sure for another week or so. As you can see in the video, I used crumpled foil, armature wire, steel wire, and aluminum mesh to add the forms to the armature. I’ll do most of the actual sculpting with the paper mache clay. That’s why you still can’t see any features on the face. I like the new illustration I found much better than the one I started with, because the first one had a face that was just painted onto a stuffed flour sack. The second illustration looks like the features are actually sculpted on the face, which will work much better. Great! I can’t wait to see it, but I know how busy you must be, so no hurry. When you’re ready, you can send your article and images to me by email. Be sure to put Paper Mache in the subject line so I don’t accidentally hit the delete button before opening it. Me encanta todo lo que sea en papel mache o cartapesta, pero me gustarìa que fuera en español porque no hablo el inglès. Gracias. Gracias por sus comentarios. Por desgracia, yo no hablo español, tampoco. (translation through Google translate). Many of them don’t have William Wallace Denslow’s artwork, so that’s the down side – for me anyway, since I found those illustrations particularly wonderful when I was little. Someday I’ll get around to finishing a childhood project of reading all 17 Oz books. If anyone else is considering Oz projects, Tik-Tok would fit right into any Steampunk theme. Unfortunately, the only book I have available in both print and ebook versions is the Make Animal Sculptures in Paper Mache Clay. Formatting illustrated books for Kindle is really hard. It essentially requires the entire book to be taken apart and rebuilt using antiquated html, and they change the rules on a regular basis – it’s hard to keep up. I do hope to get the others ready for the Kindle as well, but I don’t know when that will happen. And I’m glad I’m not the only one with too many books. I’m thinking about selling my house and finding a smaller one, but I’m not looking forward to packing up (and hefting) all those heavy boxes of books. And do I really need two sets of encyclopedias from the 1930’s? You really do find out how many books you have when you have to pack and move them, don’t you?! Even though I’ve promised to try and stick with ebooks, there’re just so many books that aren’t offered in that format. Despite what anyone says, it’s not the obvious answer for “I’m Out of Shelf Space!” – or at least not yet. There’s an image of the Scarecrow lolling over the table of contents, looking particularly spineless – I can’t remember if he actually has a broom handle spine or none at all. It’s a wildly forgiving character to design – any way you end up needing to angle him will seem fine since he always looks on the verge of falling over! Oh forgot to tell you I just ordered your new book, looking forward to looking at that and hope that a little Jack Russell like our Tinker Bell will be on our shelf. Thanks for all the inspiration. Thanks, Artis – I hope you like it! And please post a photo of your Jack Russell when he’s done. I would love to see it. Looking real good, this is so much fun to watch your scarecrow take form. I’ve started on papier maché masks using the method in this vid with a couple of changes salt etc. and I think your new mix looks great, going to make that, what is the compound I live in Ireland. And cornstarch is that the same as cornflour? Waiting for your new book. I’m not sure what they call corn starch in Ireland. It’s really fine, almost like face powder or… I’m trying to think of a product that feels like our corn starch, and I’m coming up blank. I suppose it’s like cake flour, but with a silky feel. We also have “corn meal,” which is rather coarse, and it wouldn’t work for the air dry clay formula. Just a note: you can get the books on line for free at Project Gutenberg. It might save you a trip to the Library. 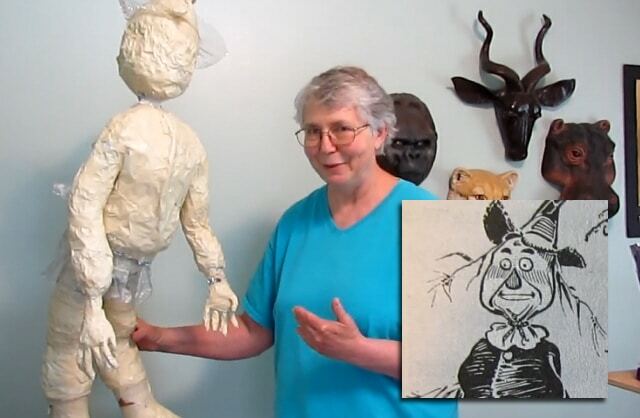 I love how the scarecrow is looking and enjoy all your how too videos! My copy of your new book arrives today. I was going to make a paper mache Corgi anyway and would like to see how you did yours. I bought your book to say thank you for all the wonderful information you give away. Summer Break is only 2 days away then I will have tons of time to start and complete many projects. Can’t wait to see how the sealer works out. I want to make something for my apartment’s patio. Thanks Lynn. I hope you like the book. There is a Corgi pattern in the book, but no photos of a Corgi. I wanted to use as few pages as possible so the price would be super-affordable. I can’t wait to see your Corgi when it’s done – please remember to post a photo here on the blog so we can all see it. 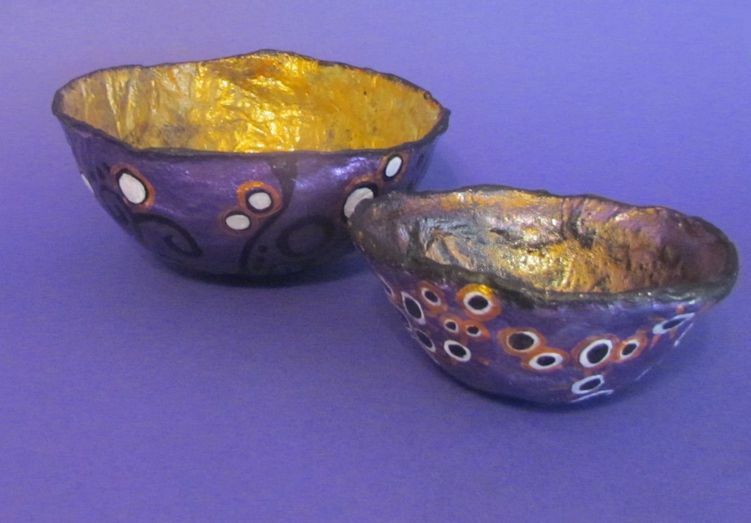 And by the way – I just love your paper mache bowls. I don’t suppose you’d be interested in writing a guest post for us, sharing some of your secrets?